1141. Blood in the stools or no? 1129. A schwanoma in a dwarf hamster? Unusual case as I seldom see pet rats as Singaporeans don't keep pet rats. 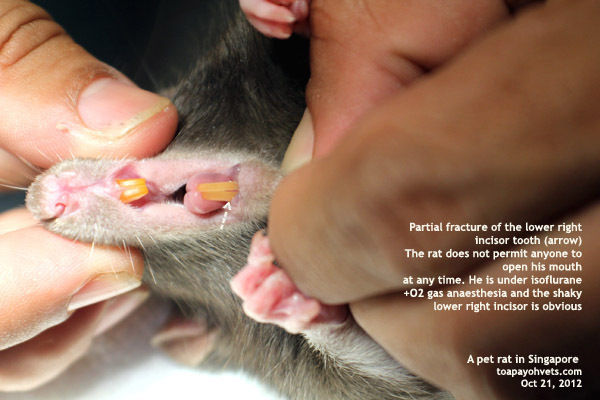 This handsome black and white rat fractured the lower gum end of his low right incisor teeth as he chewed on the bars of his cage. Hamsters and rabbits commonly do that too. The tooth did not fracture completely and so he would be feeling the pain every time he tried to eat. 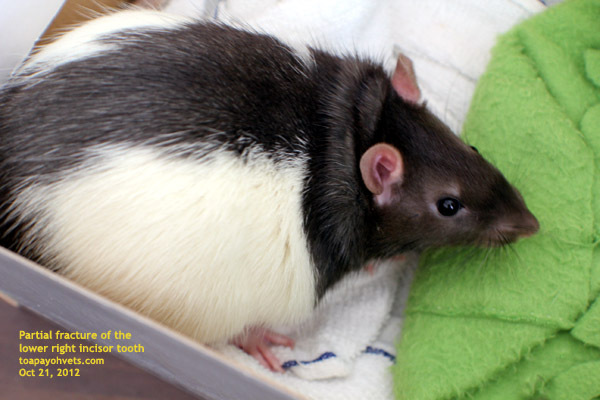 His owner quickly took him to the vet and I was surprised to see my first pet rat patient in over 30 years of practice. What is the solution? Clipping off both lower incisor teeth and levelling them. 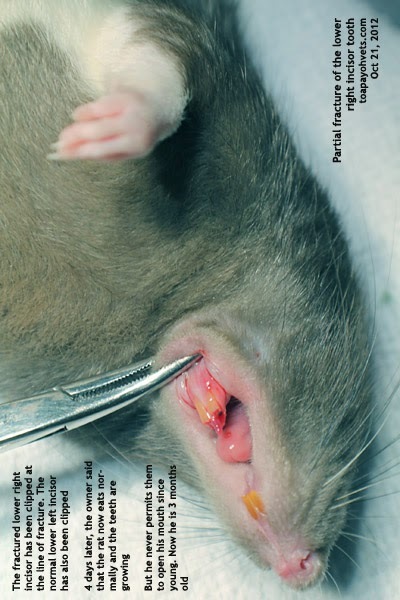 Now, this young rat strenuously object to any human opening his mouth even to examine the teeth. 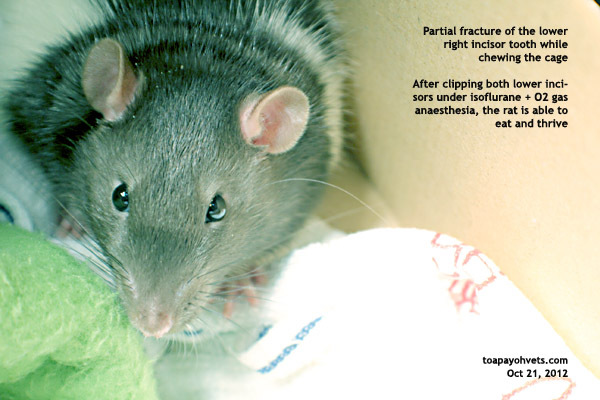 So, I needed to put him under anaesthetic isolflurane + O2 gas and clip off both lower incisors to the same gum level. His fracture was at the gum level. Thank you for the photos. S... is recovering well. Today - for the first time since the procedure - he was able to chatter his teeth (which he normally does when he's happy). He's also been able to start eating his regular Lab Blocks food again, albeit very slowly and with some difficulty as the teeth have just grown back a little bit. We're supplementing his diet with softer, easier to eat foods like vegetables and he doesn't appear to be losing an unhealthy amount of weight.